THE RANGE ROVER CLASSIC CLUB UK. "A Touch of Class"
Welcome to The RRCC UK! 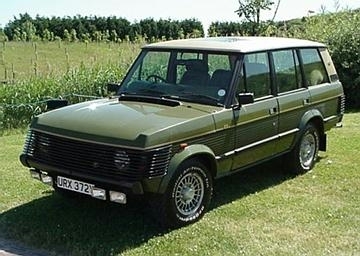 This site catres for Range Rover (1970 - 1996) enthusiasts living in the UK/Europe. As the founder of this site, I will try my up most to maintain and update this site when and where evere possible. This web site is to keep members informed, and attract a broader audience by introducing ourselves to the community. We'll use this site to inform people about our club, share ideas, and organize events and activities. As the founder of the RRCC, I'll introduce our club to non-members and give some examples of the types of activities we're involved in. I will also try to update this site where and when ever possible. If you wish to view this site in one of the following dialects: Jive, Redneck, Elmer Fudd, Swedish shef, Moron, Pig Latin or Hacker- Click the link below: and add the site address to the URL box provided. New 'Harrods' RR on 'Home' page. B177 XOW- updated pics. New bullbar! God-damm 'Add Me' promotinal link removed- too much pop up. 'Add Me' promotinal link added. B517 FDM- Featured RR 7. C838 WWK- Featured RR 6- Partialy Finished- Done soon. 1994 TDI- Featured RR 5. The Dialectizer Link added (above). ATO 124Y- Featured RR 4. IAN 818- Featured RR 3. New Hit Counter & Guestbook. What RR's do Best- Gallery. Road Test page- 1983 5 Speed. Above is a W&P Range Rover commissioned for Harrods, 1982. Although some four wheel drives were to be found on British roads as early as 1945, it was not until the early 1950's that Land Rover started to produce them in any quantity. Our Range Rovers are the "ancestors" of today's "Soft Roaders" used to ferry the kids to and from school. Any Classic Range Rover from the rare and basic early 2 Door model to the luxurious 4 Door Vogue SE Softdash, are welcome in the club. These vehicles were a common sight on the British roads during the 70's, 80's & 90's and are still evident in our club today. Thousands of these vehicles have survived (How many 1970's Jags do you see on the road these days?) which must say something about the Craftsmanship of those bygone days. Above is a Rare 1983 'In Vogue' 5 Speed Manual. Derwent Blue.